In electronics, the field-effect transistor (FET) is a crucial cornerstone and successful integration of this semiconductor device into circuit applications requires stable and ideal electrical characteristics over a wide range of temperatures and environments. 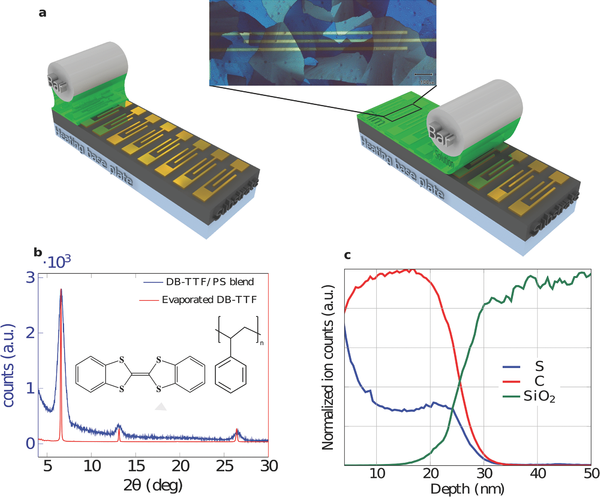 Solution processing, using printing or coating techniques, has been explored to manufacture organic field-effect transistors (OFET) on flexible carriers, enabling radically novel electronics applications. Ideal electrical characteristics, in organic materials, are typically only found in single crystals. Tiresome growth and manipulation of these hamper practical production of flexible OFETs circuits. To date, neither devices nor any circuits, based on solution-processed OFETs, has exhibited an ideal set of characteristics similar or better than today's FET technology based on amorphous silicon. Here, bar-assisted meniscus shearing of dibenzo-tetrathiafulvalene to coat-process self-organized crystalline organic semiconducting domains with high reproducibility is reported. Including these coatings as the channel in OFETs, electric field and temperature-independent charge carrier mobility and no bias stress effects are observed. Furthermore, record-high gain in OFET inverters and exceptional operational stability in both air and water are measured.